This statistic gives an overview of the frequency of visits to fast food restaurants in France in 2015. 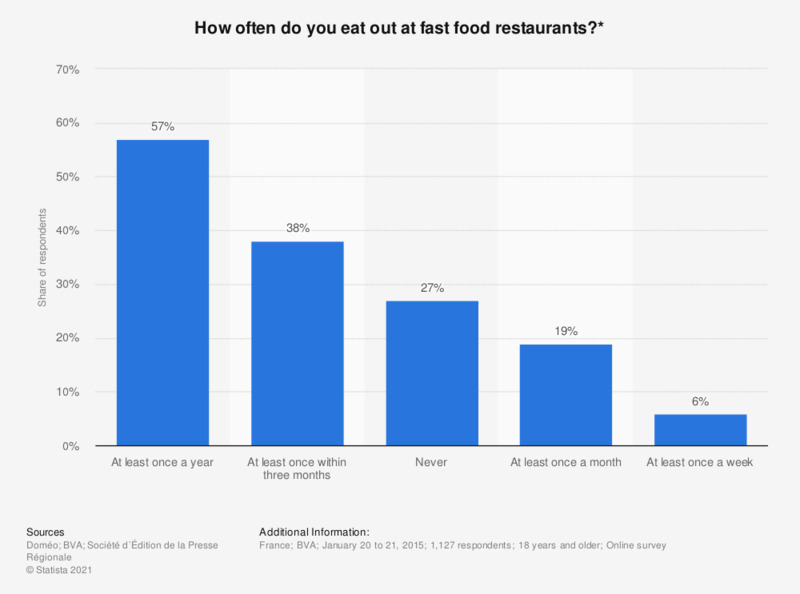 It reveals that 57 percent of respondents went to eat out at fast food restaurants at least once a year, while approximately a quarter of respondents stated that they never went to fast food restaurants. * This question was phrased by the source as follows: "Vous personnellement, vous arrive-t-il de manger dans un fast-food ( sandwicherie, kebab, chaîne de restauration rapide etc..) ?" The source adds the following information: "Sandwich bar, kebab bar, fast-food restaurant chain."